In narrative form, Robert A. Morgan offers five sermons for Advent and Christmas that will be long remembered by your congregation. The sermons are based on stories from Exodus, Numbers, Luke, John, and Matthew. Each message centers on a familiar Bible story or person, told from an interesting perspective. An easy-to-understand children's lesson, which ties directly to the major message of the day, accompanies each sermon. Robert A. Morgan is senior minister of Westminster Presbyterian Church, Austin, Minnesota. He is a graduate of Macalaster College and Yale Divinity School. This is his second CSS book. His first is titled Advent Recollections. About Robert A. Morgan (Author) : Robert A. Morgan is a published author. 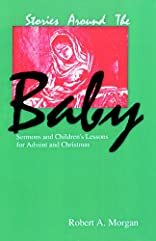 A published credit of Robert A. Morgan is Stories Around the Baby: Sermons and Children's Lessons for Advent and Christmas.